The Bible is one grand, beautiful story. Many think the Old and New Testaments to be clearly divided or they perceive God to have had a major change between the Old and New. This couldn’t be further from the truth. The Bible is one epic, overarching story about Jesus. That’s why Crossway’s Story of Redemption Bible is a great resource to have on your shelf. 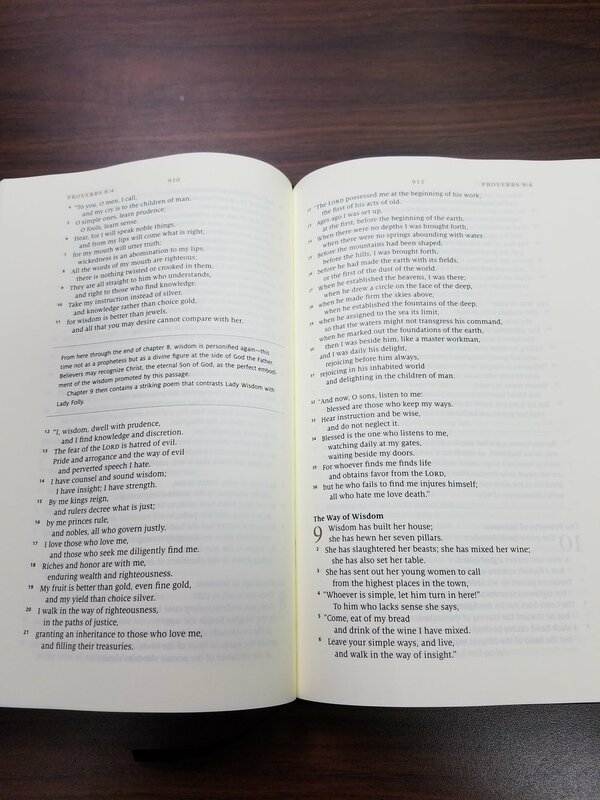 In this Bible, you will find helpful notes from pastor Greg Gilbert interspersed throughout the pages (almost 900!) helping you connect the dots to God’s grand story of salvation. This Bible is available in hardcover, TruTone leather, and top grain leather. Normally, I am a fan of leather Bibles, but I really like the hardcover of this one for one reason: the artwork. Peter Voth is a name I keep seeing pop up in the Christian circles I’m involved with. He does beautiful designs and illustrations and typically you can recognize his style and his work. I have t-shirts by Voth, but he has done all the artwork for this Bible. It’s not just the dust jacket where you will find his work though. 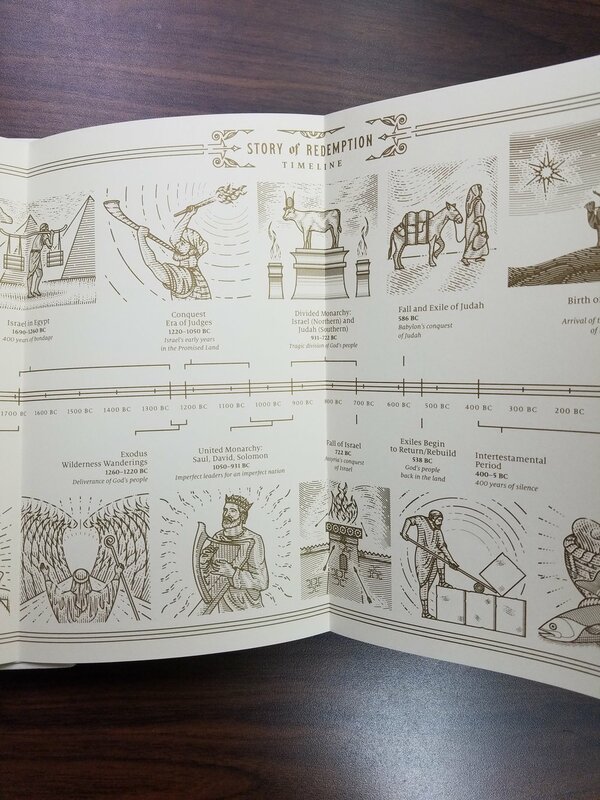 Each book of the Bible has an illustrated image and throughout the Bible are helpful maps. 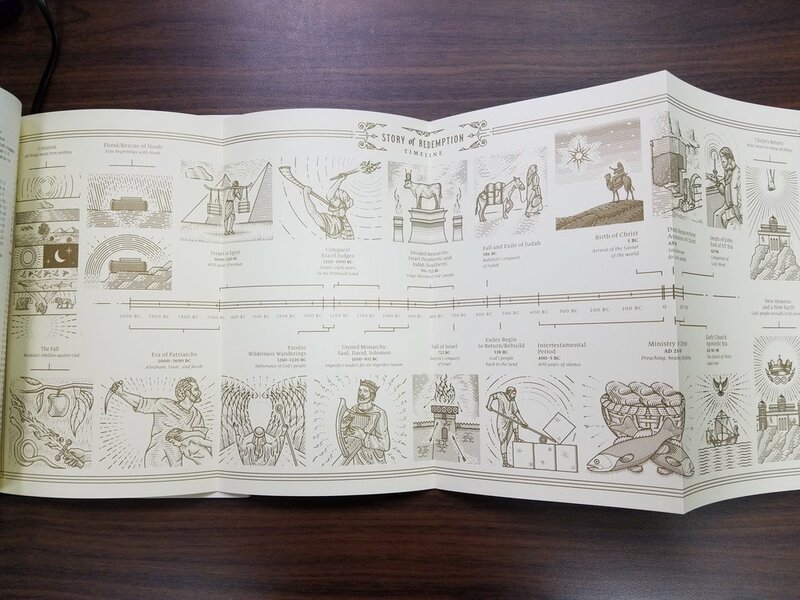 One thing that truly sets this Bible apart is the fold out timeline in the back. This timeline starts with creation and traces of the story of redemption to Christ’s return. All of it is beautifully illustrated by Peter Voth. This is a thick Bible that you most likely won’t be carrying around with you. It’s better left in one place for study. There are a few reasons for this and I think they are all good. First, the Bible has 9.25 font size with an 8.5 font size for the notes. As someone who wears glasses, this is a big deal to me. This Bible is very readable because of the font size. I’ve had other study Bibles where the notes are so small that I either need a magnifying glass or need a digital copy. I appreciate the generous font size included here. Another thing I appreciate that adds to the thickness is the generous margin size. There is plenty of room for you to write in the outer margins of this Bible. It feels as though Crossway built this Bible for study and actually thought about what a student of the Word would want. The other nice feature is the cream-colored paper. Looking at the pages of this Bible is pleasing to the eyes. One down side is the font shows through from the other side of the page (ghosting), but this is found in most Bibles and to eliminate it, this Bible would have had to be monstrously thick. It’s also worth mentioning that this Bible is single-column rather than double. I’m not sure if people think about that or not, but when I’m taking notes in my Bible, double columns make it difficult to know what I’m taking notes on. The single-column definitely contributes to the thickness, but at least for me, I prefer a thicker Bible with a single-column than a thinner Bible with a double. 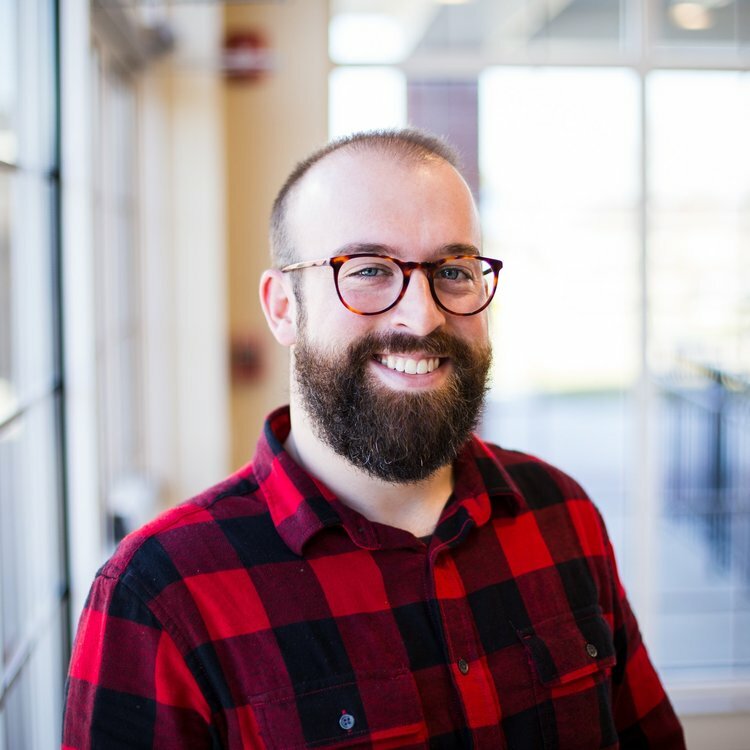 If you would love to learn more about the cohesive story that makes up the Bible, then I think you will really enjoy this resource. It is beautifully illustrated, built for notes, and includes a plethora of notes from pastor Greg Gilbert. You can pick this Bible up from Crossway, Amazon, and most places that Bibles are sold. 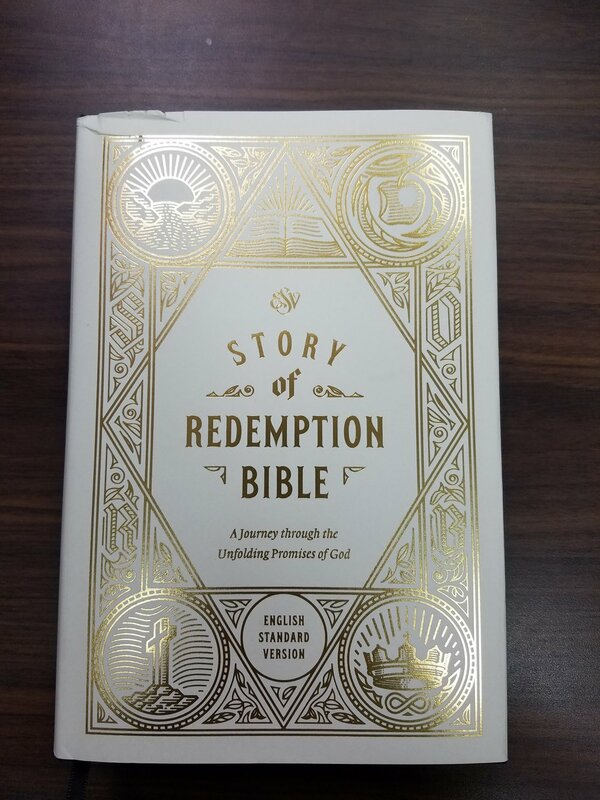 The Story of Redemption Bible is a valuable resource for a better understanding of God’s promise in Christ and a useful tool for discipleship.